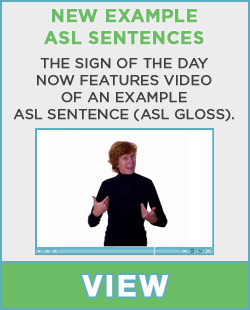 The use of space is a very important feature in American Sign Language. The way to be able to refer back to different people, places or things (referents) is to use the space around the signer. You do this by setting up the space. This is done in a three dimensional manner. It can be done in the space to the left or right of the signer, in front of the signer, in a semi-circle around the signer, or in rare cases behind the signer. The signer establishes the person, place or thing by identifying them within the sign space, and then leaving them there (in space). The signer can then refer back to that specific space every time they are talking about that referent. Other signers in the same conversation can also refer to and use this sign space once it has been established (set up). A person, place or thing can be fingerspelled in a certain location. You can make a sign in that location. A sign classifier can be signed in that location. The use of a directional verb can be signed toward a certain location. One rule of thumb is to never set up more than six referents in any one conversation. Even that can be too many if there is going to be a lot of information associated with each. The proper use of space can make your signing much clearer and easily understood when done following these rules.